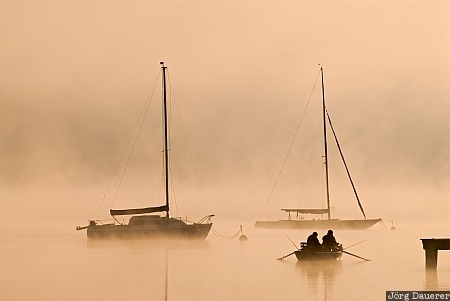 Silhouettes of sailing boats and fog in Dießen at the southern end of Ammersee. Dießen is south west of Munich in the county of Oberbayern, Bavaria, Germany. This photo was taken in the morning of a sunny day in August of 2008. This photo is part of the exhibition Landscape Fog (October 2008). This photo was the image of the month in March of 2013. This photo was taken with a digital camera.